After you create a new ad campaign and send it to the Direct server, the “Draft” status is assigned to it. This campaign can be submitted for moderation. You can launch a campaign only after successfully passing moderation and making a payment. Payment for ad campaigns is currently only available in the web interface. Select the necessary campaign in the Campaigns tab. 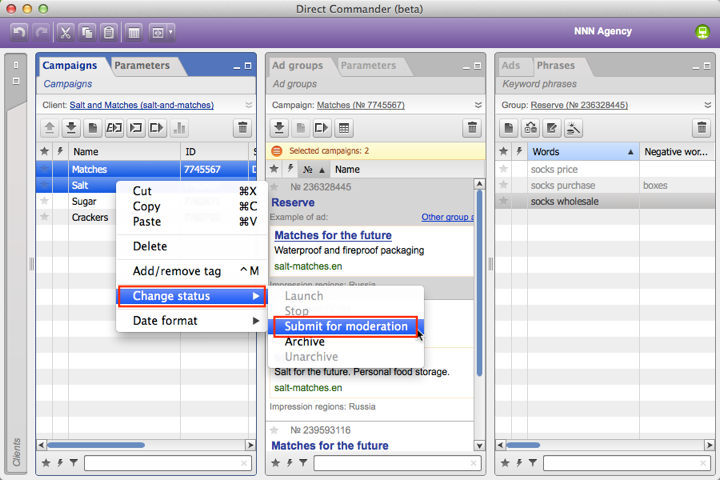 You can instantly select several campaigns by holding the Ctrl or Shift keys. Right-click on the selected campaigns. 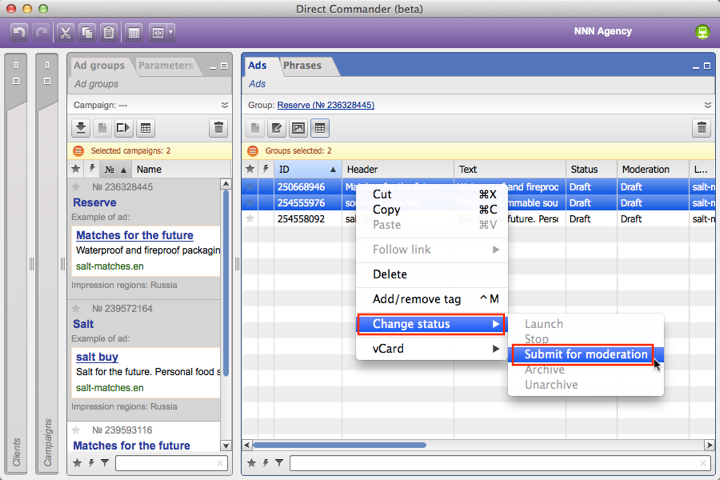 Select Change status in the context menu and select the necessary action. Select the necessary campaign in the Campaigns tab. 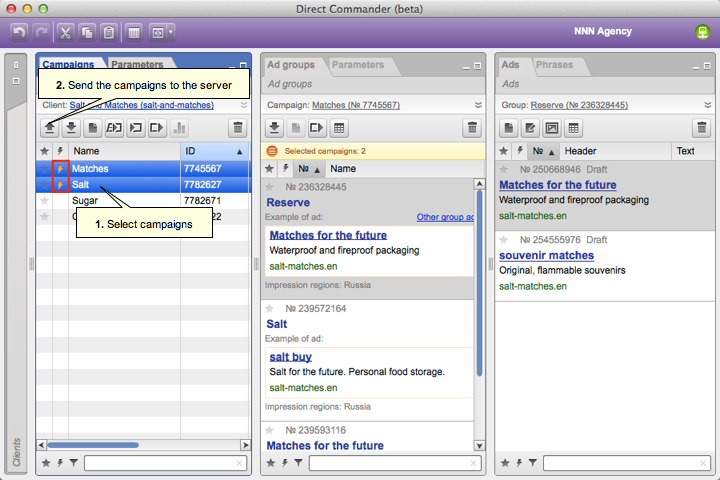 You can instantly select several campaigns by holding the Ctrl or Shift keys. 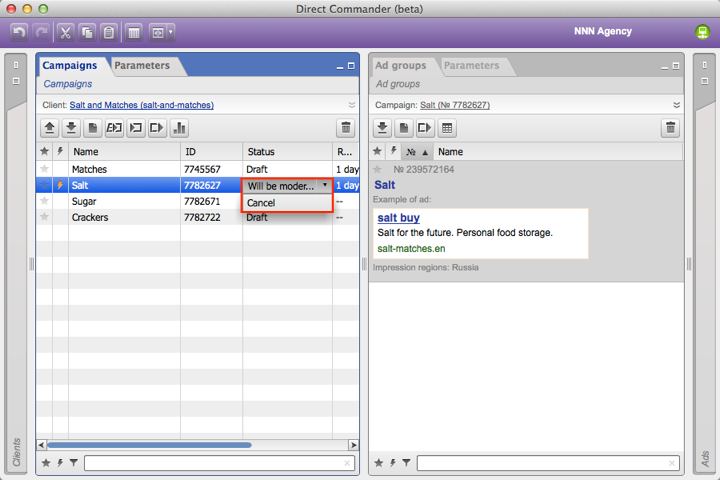 Groups from all selected campaigns will be displayed in the Ad groups tab. Select the group you need in the Ad groups tab. You can instantly select several groups by holding the Ctrl or Shift keys. Ads from all selected groups will be displayed in the Ads tab. Select the necessary ad in the Ads tab. You can instantly select several ads by holding the Ctrl or Shift keys. Right-click on the selected ads. Select Change status in the context menu and select the necessary action. 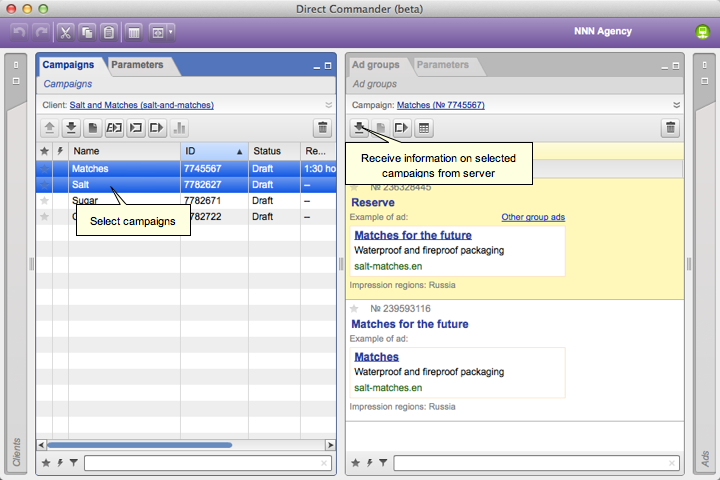 After changing the status of the campaigns or ads, send the changes to the Direct server. Changes to the status of a campaign or ad can be changed until it is sent to the server. To do so, select the Cancel in the “Status” field.